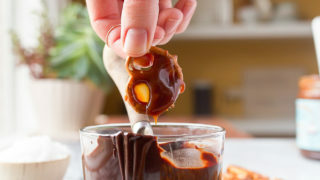 Chocolate caramel pretzel bites recipe made with salted caramel sauce and chocolate. The best sweet and salty 15 minute snack! The other night, I had one of those dreams again…the one where I’m working in a bakery. It just feels so real. My hair is stiff with powdered sugar splashes, my fingers feel as if they’ve been dipped in corn syrup and rolled in sugar, and the air is dense with aromas of buttery caramel. It’s on these nights that I wake up in a puddle of my own drool. I also wake up very hungry, and stumble into the kitchen for a sweet snack. I think my dream was trying to remind me that I had a jar of salted caramel sauce in the pantry. I’m not why I bought it, but it was just sitting there, in its salty, thick glory, waiting to be cracked open. It was hiding behind a can of tomatoes, just waiting for its moment. Today is the day! I had a bag of gluten-free pretzel twists in my pantry, an overflowing supply of chocolate (like always), and these chocolate caramel pretzel bites were born. I always devour them in less time than it takes to make them, and you will too! I know most recipes for pretzel bites use bagged caramels, but I have a little problem keeping those around the house for very long…I can’t stop snacking on them. (Trader Joe’s makes fleur de sel caramels, and they jump into my cart weekly, no matter how much I try to block them). But the good news is that you can use jarred caramel sauce instead! It needs to be real caramel sauce, though–not caramel topping, which is too thin to coat the pretzels well. 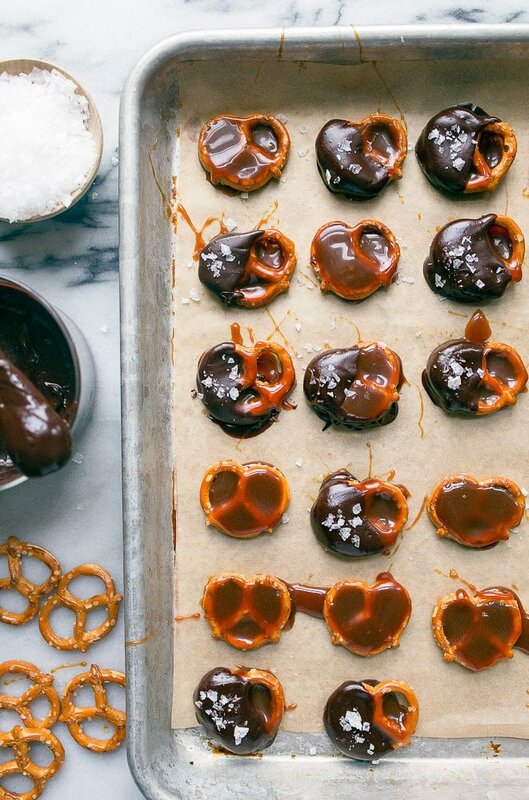 I dunk each pretzel twist into the thick caramel, and then place it on a baking sheet to freeze. While the caramel hardens on the pretzels, I chop and melt the chocolate. If you’re not great with melting chocolate in a double boiler or microwave, go ahead and buy chocolate almond bark. Almond bark is much more forgiving. I have my days where I melt chocolate perfectly, and then I have days where I seize three batches in a row (that was last week…yikes). These are: messy, sticky, crunchy, salty, chocolatey, gooey, creamy, and addicting. Make as many as you feel like…do I really need to post a recipe for this? It’s basically just a snack idea. If you’re a salted caramel lover like me, have you seen my salted caramel eclairs? Admittedly, there’s a bit more time-consuming than this 15-minute snack, but just as delicious! 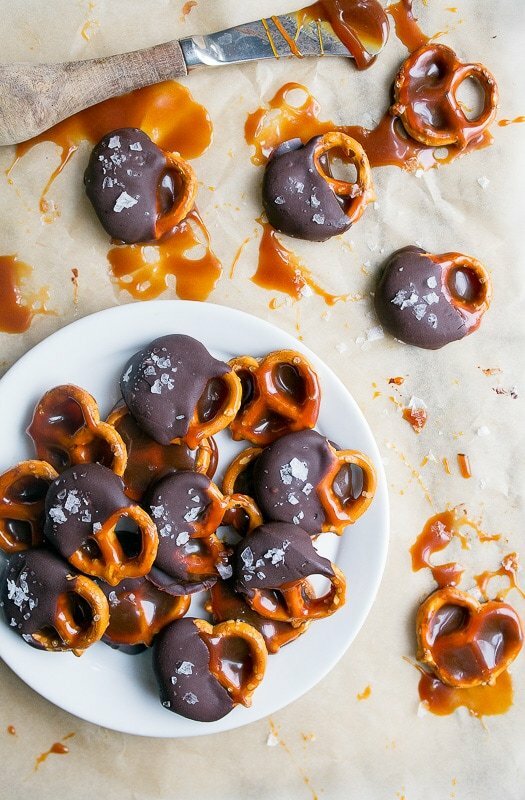 Chocolate covered caramel pretzel bites. Line up the pretzels on a non-stick surface (I used parchment paper on a baking sheet). Use a spoon or small knife to dollop caramel sauce on top of each pretzel. Place in freezer. Meanwhile, place the chocolate chunks in a double boiler over simmering water and stir until melted. (Alternatively, melt the chocolate in the microwave at 50% power, stirring every 30 seconds until melted. 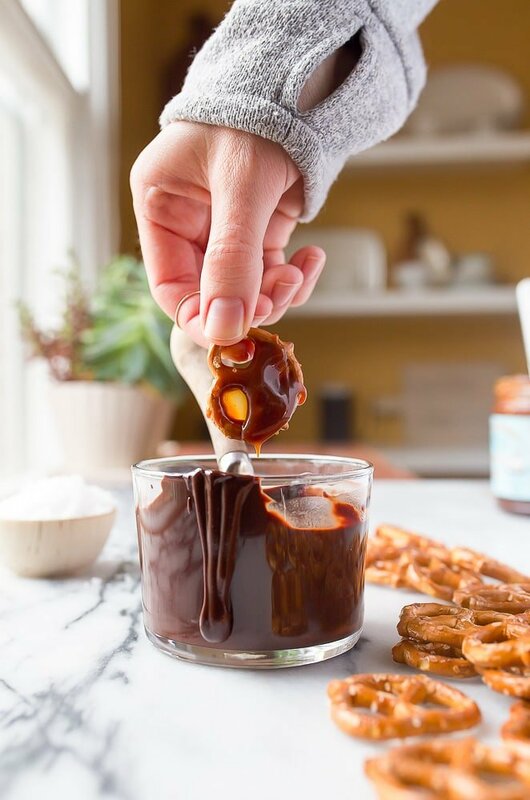 Remove the caramel pretzels from the freezer, dunk each in chocolate, and place back on the sheet. Sprinkle with salt, return to the freezer. Let the chocolate set, about 5 minutes in the freezer. Serve. They're sticky and delicious. Enjoy. Um I LOVE your dreams! Working in a bakery? I’m in! Mine are usually about forgetting my pants or anxiety over whatever thing I’m stressing about at the moment, ha. I can’t resist a good salty/sweet combo, so this is right up my alley sister! omgeee these bites are so simple but GENIUS and yum yum yummmmmmyyy! Hey girl- this is right up my alley! Yummy! Did you use unsalted pretzels for this? I used salted ones. Sorry, I should have clarified that! And they weren’t too salty? I thought maybe with the added sea salt at the end + salted pretzels, they would be too salty. But I’ll take your word for it, because I do love me some salted caramel, and I always have salted pretzels on hand. Thanks! What commercial caramel sauce do you use? Maybe you can’t reveal. Can you make your own? If so, what recipe?